Deanna Marie in Wilde Tales. Photo by Jingxi Zhang. BOTTOM LINE: Charming and bittersweet fables from an eager ensemble. While Oscar Wilde is best known for such incisive comedies as Lady Windermere’s Fan and The Importance of Being Earnest, his lesser-known children’s stories reveal a softer heart beneath the whiplash Wildean wit. 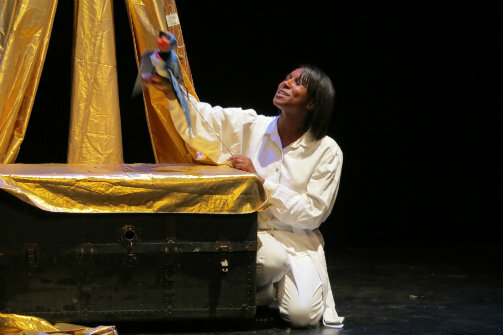 Using ensemble storytelling, puppetry, and music, Dry With a Twist Theatrics stages three of these fairy tales, connected by the themes of love, devotion, and loss. Swooping and twirling a hand-held bird puppet, ensemble member Deanna Marie ushers us into Wilde’s world with an a capella version of her original piece “The Swallow’s Song.” The company neatly segues into “The Happy Prince,” in which Marie plays a Swallow migrating to Egypt for the winter. Pausing en route in a faraway city, the Swallow befriends a statue of its former ruler, the so-called “Happy Prince” (Geoffrey Hymers). Troubled by the destitution of his land, the now unhappy Prince enlists the Swallow to deliver pieces of his gilded-and-bejeweled body to his subjects—a process winsomely rendered as the ensemble strips gold drapery and papier-mâché accessories from Hymers and into the hands of sad-eyed marionettes. Though this act wears away both Swallow and Prince, each finds redemption through the love and friendship they share. The second tale, “The Nightingale and The Rose,” follows a philosophy student (a comically lovelorn Drew Paramore), kept from his snobbish beloved for want of a single red rose. Moved by his plight, a friendly Nightingale (Sabrina Michelle Wardlaw) seeks out the flower, but finds the student’s garden barren. She learns that to coax the rosebush into bloom, she must pierce her heart upon its thorn while singing a pure melody. The piece’s climax, in which Wardlaw sings a poignant “The Rose of Tralee” as three rosebushes egg on her sacrifice, is especially haunting, and rendered even more tragic when the rose fails to win the young woman’s affection. Told mostly through song, the final tale, “The Fisherman and His Soul,” tells of a poor fisherman (Justin Hart) who forfeits his soul for the love of a mermaid (Sandra Bates). Abandoned without the fisherman’s heart to guide him, the errant soul (Paramore, again) tempts his former master away from the mermaid and into a spiral of crime and debauchery. Returning to the sea in disgust, the fisherman finds his mermaid dead from a broken heart, and quickly joins her as his soul is left to wander heartless. Hart and Bates share a convincing chemistry that underscores this sad ending, and Wardlaw and the ensemble have a standout dance sequence as a witch and her imps who cast out the fisherman’s soul.